To improve living conditions, attract business and reduce the constant threat of disease, Kabul’s Old City has been cleared of rubbish and mud — so much that street levels dropped by nine feet uncovering building foundations submerged for over 60 years. Thanks to the Turquoise Mountain Foundation’s clean-up and restoration of the original ground level, access routes have been improved so that work on a new sanitation system for the area in conjunction with the Kabul Municipality and the Ministry of Urban Development can go forward. Together they’ve laid over 120 meters of drainage system pipes and two wells have been dug to provide potable water. Perhaps best of all, the efforts have provided work for 70 unemployed Afghan men. The Geneva-based Foundation, funded by both Western and Middle-Eastern donors, is investing in the regeneration of the historic commercial centre of Kabul, providing basic services, saving historic buildings and constructing a new bazaar and galleries for traditional craft businesses. It has established Afghanistan’s first Centre for Traditional Afghan Arts and Architecture and gathered some of the greatest master craftsmen in the country to train students in wood, calligraphy and ceramics. The Centre has been used to develop new Afghan designs, promote Afghan handicrafts through national and international exhibitions, open new markets, restore key parts of the Kabul museum collection, renovate public spaces and build capacity in the government and universities. 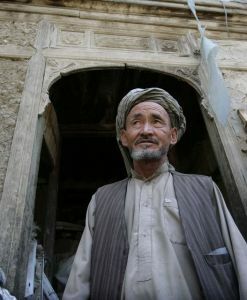 Most importantly however, the Foundation uses the resources and skills of the Centre to serve Afghan communities. Its particular focus has been the area of Murad Khane in the old city but it has also worked in a fort in Kart-e-Parwan and invested in the potter’s community in the village of Istalif. In each case, the Foundation has delivered services to the community, supported local businesses, trained local students, protected historic areas, attracted visitors and improved living standards.